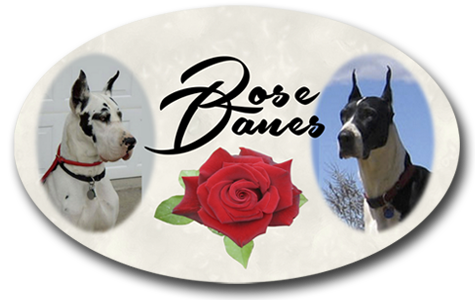 A Rose Great Danes litter was born September 17th, 2013! Beautiful Great Dane girl OREO is now a proud mama to 7 babies…three harles show marked, four mantles with three of them being show marked…and the fourth nicely marked. Babies are healthy, happy and OREO is an excellent mother! Both parents are in excellent health, and pups will be sold with a health guarantee. This is a rare chance to own an exceptional bloodline. Champions in the Great Dane puppies’ bloodline include Danes from GMJ, BMW, Meistersinger, Michael Dane JB Danes – including Bull Lea, Clorox, AJ, Victoria’s Secret, Poker, Pockets, Hummer, Jag, Ace and many more. Pedigrees are posted on the ancestors page. See the photo gallery of these pups! Two Harlequin Great Dane sisters… Available to qualified homes. Check out our blog for updates! Oreo and Hamilton’s beautiful great dane pups at 10 days old. Babies are healthy and happy and well cared for… Mama dog OREO is doing an excellent job. Call 970-259-1128 or e-mail Sam for more information. Click on the links below to view pictures of previous puppies.